A deep look at ocean circulation returns a surprise: Currents transport water — and non-degradable, floating plastic — between the ocean basins. Thus, some of the plastic in the South Atlantic “garbage gyre” was actually thrown away in nations bordering the Indian Ocean. Map of global surface ocean shows flow speed (red) and direction (arrows) averaged over 48 weeks. When currents converge, they form gyres that are infamous for the accumulations of plastic garbage. 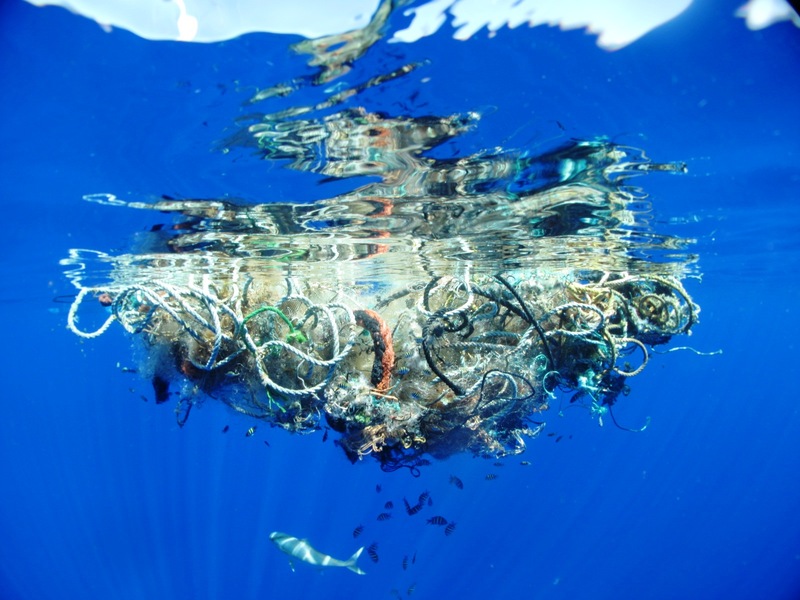 Although the discovery of garbage patches has focused concern on the gyres, a new study in the journal Chaos looks instead at how the same flow of ocean currents that makes garbage patches also delineates the functional boundaries of the oceans. Small task: Map the oceans! The mathematical model described in the paper started with estimates of the speed and direction of ocean currents at the surface. “The current information we are using comes from a highly regarded ocean model, produced by international ocean modeling experts, which has undergone many internationally peer-reviewed tests,” Froyland wrote us. 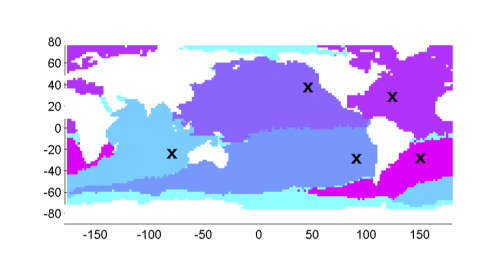 The catchment areas of the world’s oceans don’t follow the boundaries on maps. Driven by the wind, currents sometimes move water between oceans. Adapted by Why Files from image courtesy Gary Froyland, University of New South Wales. As required, the model showed gyres at the position of the garbage patches. However, because “each ocean ‘leaks’ to some extent to its neighbors,” Froyland said, floating junk can, on occasion, play trash-patch tourist and visit a different gyre. Garbage: It’s a sharing thing! Just as rivers get water from their watersheds, oceans get their water (and floating debris) from “catchment areas,” and the study’s paramount goal was to mark out catchment areas for the oceans. The result was unexpected: water and garbage from Mozambique, for example, reaches the South Atlantic garbage gyre within 10 years. Plastic particles are collected as a manta net is towed across the ocean surface. This debris was collected inside the manta net during a tow; note how the sample is dominated by tiny plastic particles – the white particles are about 0.5 centimeter across. Small plastic debris shows that a “garbage gyre” is mostly water with a dense concentration of plastic.